Established in 1976, Bertram Signs & Graphics specializes in all types of signage. From vinyl banners, window lettering, business cards, a-frames, and vehicle lettering to large custom business signs, dimensional letters, real estate signs, and decorative indoor signage. 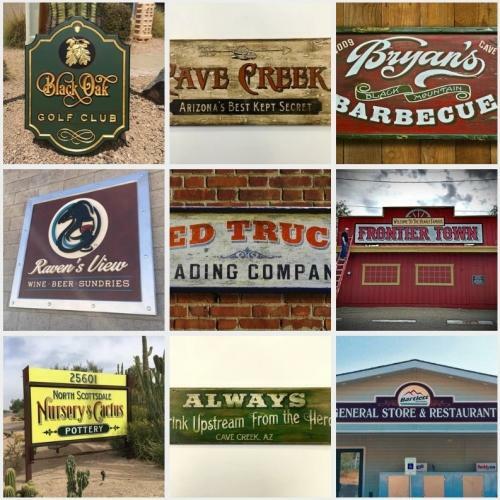 If you need a sign for your home or business, please give us a call at 480-595-4744 or stop by our shop Monday through Friday, between 7:30 am-5 pm, located in the Carefree Studios, in Carefree, Arizona. Painted Signs // Dimensional Signs & Letters // Vinyl Graphics // Banners & A-frames // Business Cards // Vehicle Lettering/Partial Wraps // Antique/Vintage Signs // Much more.